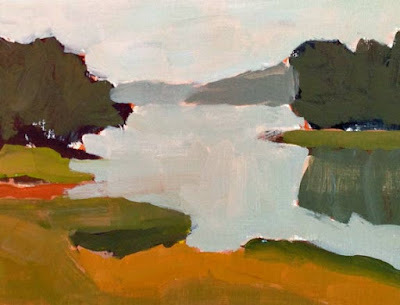 This is a demo I did for my plein air class at Tidewater Farm earlier this month. Underneath is a value painting in burnt sienna, ultramarine blue, and white acrylic. The color layer on top is oil paint. Just a quick thing, but so fun to do! We all agreed we could do a lot of paintings of this view, standing under the shady white pine tree. Une belle démonstration. Je suis certaine que vous avez passé un excellent moment. Le lieu me semble sympathique. Bobbi, your painting caught my eye this morning and I've loved scrolling through your blog. Both your captivating art and your written accompaniment speak to me. Thank you for sharing thoughts, process, paint colors, paintings, and YOU. I am newly on my own journey into art. One piece of that journey is a just-this-week commitment to commenting when I'm drawn to a painter, so here I am to say hello! The softness and simplicity of "Sentinels" are particularly appealing to me. Love the shapes and colors! It was a treat to discover your work! Really like this one Bobbi! You and your class must have had a blast.